Looking for something fun to do in the Bromley half term? Maybe some of these suggestions can help? The Church House Gardens in Bromley town centre (main access next to the Churchill Theatre) have a wonderful play area, skate park and duck pond. Hussywell Park (BR2 7DD) is shaded, small and quiet with a lovely play area for young children and a small duck pond. Kelsey Park (BR3 3LS) - large park with river and ducks, a large play area, a small food hut, Ice cream van and toilets! Lots of benches and picnic spots. Some parts of the park are dog free zones. Northbrook park (SE12 0PS) - Has a fantastic climbing frame, zip wire and a wooden Wigwam in their large play area. Widmore Recreational Ground (BR1 2RN) is a quiet set back play park and basketball court. Scadbury Park (BR7 6LS) - A large open space and woodland area with lots of walks and nature trails to take. Kings Meadow (BR1 5AF) - rectangle open space with a path all around a large green space and a play area in one corner. - The Lavender House Cafe is close by. The Lavender House Cafe - A wonderful cafe with a lovely outdoor play area and kids menu. Make finger and stick puppets and a theatre to create your own dinosaur show!Drop in activity from 2 pm until 3.30 pm (session ends at 4 pm)Aged 4+, adults must accompany children. The stars of Britain’s Got Talent will be working with the children to create a routine with a performance at the end, as well as a QandA session and opportunities for autographs and photos. Tickets £20 with half price sibling discount. A beautiful ballet interpretation of The Ugly Duckling. This much-loved story will be told through ballet and mime, with costumes, performance and games. Tickets £10 with half price sibling discount. Would-be princesses are invited to dress-up and join in a fun-packed workshop featuring magical storytelling with songs, dancing and games. Based on the much-loved book by Dr Seuss, The Cat In The Hat is a lively and engaging first theatre experience for young children. 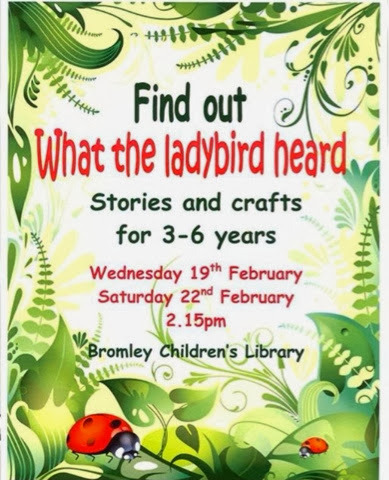 Come along to Central Library on Wednesday, 19th February and/or Saturday, 22nd February at 2.15pm and find out 'What the Ladybird Heard'. Suitable for children aged 3-6 years. Join us for FREE Children's Activities outside Zara at intu Bromley this Half Term. There's a different activity every day so your little ones will never be bored! This holiday's theme is Pirates and Fairies so get ready to decorate your own fairy wings, bandanas, pirate hats and eye patches along with treasure chests, fairy wands, pirate swords and bunting. A Circus themed event - a prize for best costume. £8 includes music session (songs, instruments and puppets) face painting and lunch box - the cafe also has a children's play area. Open 9-4 £3 per adult £1.50 per child (age 2+) lovely farm with plenty of animals to pet and feed. Set in the garden centre, there's a lovely nature trail with a bark path (managable for prams) lots of interesting animals - wallaby's and hides holes such as wooden huts and an arch of trees. Fabulous fun for little ones! Join the Ruxley Rascals this February half term decorating two fairy cakes with rainbow coloured icing and sweets! Price includes two fairy cakes (baked by our chefs in-house), a selection of icing and sweets to decorate, and a FREE gift bag to take both cakes home in! Ruxley Manor also has a soft play area. We love to go here with colouring pads and crayons - the gallery fully welcomes little artists. The gallery is free - but please leave a donation! The cafe is very expensive (£2.80 for a small plain gingerbread man!) so take your own snack! We always buy a postcard after each visit and write about our visit.